One of Rupert Murdoch's British newspapers is drawing fire for a very provocative cartoon about the phone hacking scandal. The cartoon appeared in Thursday's edition of The Times, a News Corp.-owned paper. It was drawn by the paper's resident cartoonist Peter Brookes. 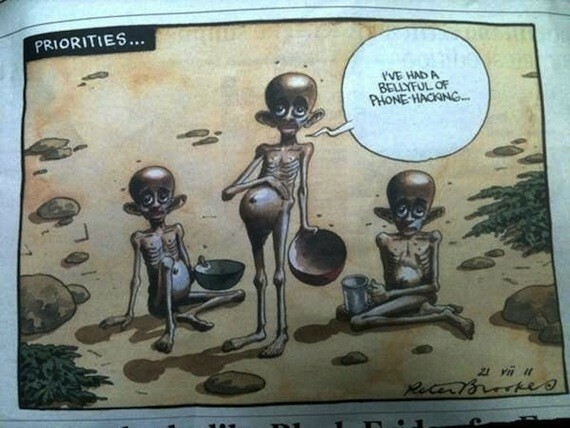 Under the word "Priorities," the cartoon depicts a group of starving Somalian children—a reference to the famine and humanitarian crisis currently devastating that country. One of the children says, "I've had a bellyful of phone-hacking." An editor at the Guardian posted the cartoon on Twitter, and it immediately caused a huge outcry. "Horrendous" was just one of the terms being used to describe the drawing. One of the more notable responses came from Emma Keller, the wife of New York Times editor Bill Keller. "Anyone else wondering if this cartoon is part of the Edelman strategy?" she asked, referring to the PR agency Murdoch has hired. The cartoon is just one of several aggressive responses that people at various News Corp. media outlets have made in the wake of the crisis. Some of the other defenses have come from Bill O'Reilly and the editorial page of the Wall Street Journal.